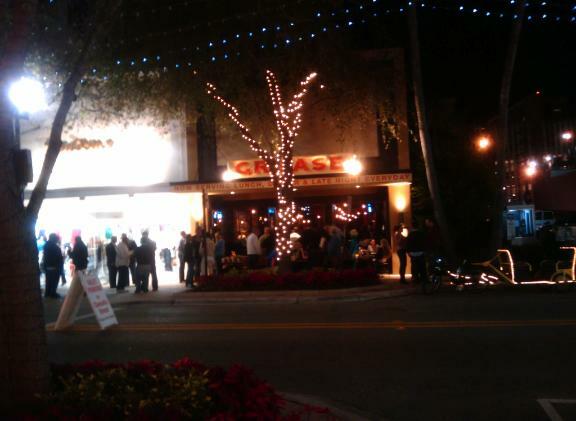 Update: The Grease Burger Bar appears to have been hugely successful since its opening in January 2009 until now in late June 2009. They are currently having an interesting contest - they have found a large statue of a steer and put it up on their roof overlooking the 200 block of Clematis Street (picture below). They are having a contest to name the steer. There are various awards, but you need to come up with that perfect name first, and quick (this contest only lasts for a week or so). I believe you can provide your suggested name for the steer, at the restaurant itself or e-mail it in. If the name that you thought up is selected, you win a free burger every week for one year. Update: The famous Grease steer has been named! One lucky winner came up with the best name, which won out over many other worthy entries. Stop by and introduce yourself to Fred-A-Steer. I guess this is a take-off on the classic movie actor/dancer/singer Fred Astaire (not sure if I've got the spelling right on either of those, but you get the idea). 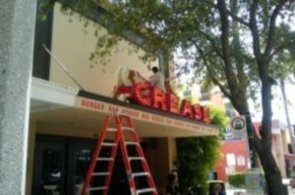 I happened to be walking by Grease Burger Bar just before noon one day last week, when a red ladder had been put up, and an employee had ascended to the roof and placed a red wreath around the steer, officially naming him Fred-A-Steer. I snapped a picture of this official naming ceremony (second picture below). 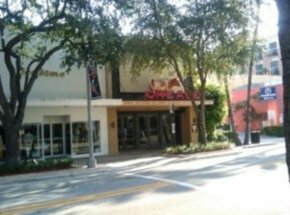 The north side of the Clematis Street 200 block has seen a recent explosion of new restaurant openings. While the furniture business struggles a bit on the 300 block, the food and entertainment business is simply booming on the 200 block. It seems that in the down economy, people are still willing to spend on eating out. Notably, the more successful of the new restaurants have been the ones that offer food and drink at the more affordable prices. Forte Aspirino, the first-to-arrive and most expensive of this bunch of new restaurants, seems to be surviving, although it is rarely packed with people. On the other hand, Clematis Social, a somewhat more affordable and open-to-the-air kind of place, has been a huge hit, rivaling the most successful restaurant on the entire street (Rocco's Tacos directly across the street). The latest addition sprung up literally out of nowhere in the last week of January 2009, from what used to be a small bar named Nobles. Now it's GREASE burger bar, what a name! This is a name that tells you what you're going to get, without any doubt. If you want a good burger and a good beer at a good price, how can you go wrong at Grease burger bar? It may be too early to say how successful this restaurant will be in the long-term, but it's opening party drew huge crowds on Friday night and it has been crowded from day one since dining tables first appeared next to the long bar and outside the restaurant. It seems like the more restaurants appear on this block, the more people come to the block to eat here. Instead of the restaurants competing against each other, they are feeding off each other's success, with the word getting out that this is the place to come to eat. The ever more affordable choices are in perfect synch with the current economy, as this block booms like never before. It is truly strange to see what is happening on this block at the very same time that the national economy is going in the other direction. The businesses here are clearly tapped into what consumers want in these trying times.